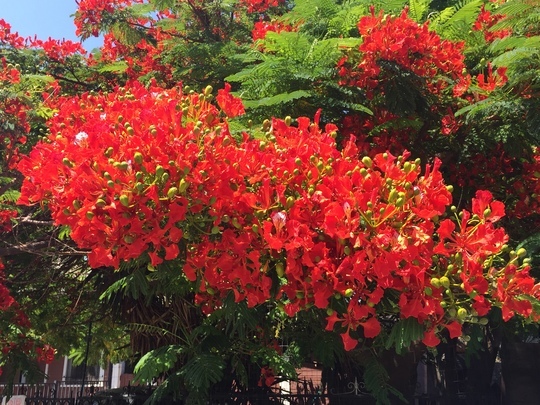 This is a close up of the Royal Poinciana flowers. Photo taken Aug. 8, 2018. Wow that hits you in the eyes stunning. It is extremely stunning in person. This pic almost looks like the pic I used several years back of my avatar. I can imagine it is. You ll have to use this one even though your present avatar looks similar. Yes, it needs to be updated. I think the other photo was taken with my old camera. I take most of photos with my phone camera now. Some phones take better photos than cameras don't they. Oh yes, many of the new phones have good HDR (High Dynamic Range), which improves the picture quality. Most people here now are buying the old type simpler phones it was in the news the other day. I wonder why? Here, of course, the smart phones are the fasted selling around. It's because of of every one being tracked by their phone even if you turn the tracking off which was in the news the other day if only they new devices are also placed in most electrical things you buy like fridges washing machines tvs etc to spy on us. Every where we go we are on camera jut like the Eastern block of Germany years ago even our councils have been told off for using cctv not for its purpose they were using it to fine people. They are even in cars to track us also our bank cards used at cash points what they want and the EU it to be able to track every car and person it's called Gallileo which the UK has put most of the money into also the brains. A few weeks ago some were still flowering, which is unusual. It's been the hottest or close to the hottest summer on record for most cities in San Diego County.